J.J. Johnson (born James Louis Johnson; January 22, 1924, Indianapolis, Indiana) was a jazz trombonist, composer and arranger. He was sometimes credited as Jay Jay Johnson. 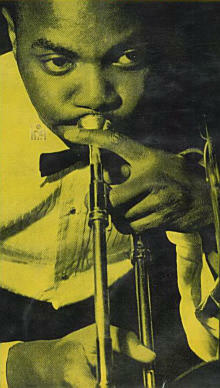 Johnson received early training as a pianist, and at age 14 he began to study the trombone. He became a professional musician in 1941 and during the decade worked in the orchestras of Benny Carter and Count Basie. Especially spotlighted with the solo he performed on "Rambo" (or "Bambo") with Count Basie Orchestra in 1946; J.J. Johnson had adapted his playing completely to the "Bop" style. Therefore he can be considered as the first bop-trombonist of the jazz history; and he had an influence on all the trombonists in that period, as well as the extant ones. J.J. Johnson had a fantastic tone, as well as an excellent technique. Therefore the most rapid tempos was not forming any problem to him; besides, his velvet-tone was not any deforming whatever he plays. Even able to do so with a difficult and clumsy instrument like "trombone"; was enough to show his excellence. Johnson toured with the territory bands of Clarence Love and Snookum Russell during 1941-1942, and then spent 1942-1945 with Benny Carter's big band. He made his recording debut with Carter (taking a solo on "Love for Sale" in 1943), and played at the first JATP (Jazz at the Philharmonic) concert on 1944. Johnson also had plenty of solo space during his stay with Count Basie's Orchestra (1945-1946). During 1946-1950, he played with all of the top bop musicians, including Charlie Parker (with whom he recorded in 1947), the Dizzy Gillespie big band, Illinois Jacquet (1947-1949), and the Miles Davis Birth of the Cool Nonet. His own recordings from the era included such sidemen as Bud Powell and a young Sonny Rollins. from the album » "J.J.'s Broadway (Verve)"
Johnson, who also recorded with the Metronome All-Stars, played with Oscar Pettiford (1951) and Miles Davis (1952), but then was outside of music, working as a blueprint inspector for two years (1952-1954). His fortunes changed when, in August 1954, he formed a two-trombone quintet with Kai Winding that became known as "Jay and Kai" and was quite popular during its two years. Although he was writing music all along, he studied especially "composition" and "orchestration" beginning from 1950s. As well as he composed serious long-works, he also began scoring music for films and TV series. In 1950s; he also continued to perform with various groups; especially the duets with fellow trombonist Kai Winding have been recognized as watersheds in the evolution of jazz trombone technique. Beginning from 1960s, J.J. Johnson began to interest with "modal music"; and he adapted it to his own style. He continued to play superior performances; for example on songs "So What" with his own group in 1964; and "El Camino Real" (his own composition). late '90s and early into the 2000s, the legendary musician fell ill with prostate cancer, and sadly took his own life on February 4, 2001. ~Cüneyt Sermet - "Caz'ın İçinden"